There are many images in my albums, that transport me back to Peru and the wonderful days we spent there last fall. Of the colourful, pensive Quechua women, their lovely rosy cheeked little children, the Ceviches, the stuffed potatoes (!) and the Pisco sours, the amazing Incan architecture of the sacred valley, the streets of Qusco city – the heart of cultural Peru – and many many more! But as much as all of these are intrinsic parts of Peru’s cultural fabric, I feel it is the magical setting of Machu Picchu that remains the quintessential icon of Peru. Machu Picchu is what we had gone to see, and this view of the Lost City of the Incas is my chosen subject for the ‘Picture The World‘ project at The Departure Board website. The faintly visible rays of the morning sun kissing the Incan stonework and the fortuitous presence of a couple of Llamas, are the reasons why I eschewed the classic, postcard view of the Citadel in favour of this one. I hope you like it as much as I do. Many thanks to Suzanne of The travelbunny for my nomination. In turn I get to nominate two other bloggers to submit photos for other countries, and I’m going with Bama of What an Amazing World for his more than amazing photos from Indonesia and James of Plus Ultra for his wonderful travel vignettes from around the world. And if you want to showcase one of your photographs to complete the Picture The World project, you can do so here. Do remember to email them a link to your post. Ah you have such beautiful pictures Madhu! I can’t believe it was 12 years ago since I was there but it is indeed a very special, magical place. But I am sure it is still etched in your mind! One cannot forget a sight like that! Good thing I kept a very accurate journal of the event. I would love to go back someday and hike it with my son when he is older. Wouldn’t that be something? You know I love your pictures, Madhu. But you words transport me there, I leave this blog feeling like I have been to Peru. Oh, thank you so much Jim! Your generous words make my efforts worthwhile! The Andes create a spectacular backdrop Gerry. Thank you for the visit. If only I could transport myself into your picture….it’s beautiful! By the way, thanks a lot for the nomination. I feel honored! Now I have to dig into my archives to look for the best picture to represent Indonesia. Did you travel there on your own or with the travel agent? I’d love to visit Peru in the near future. Beautiful photo! 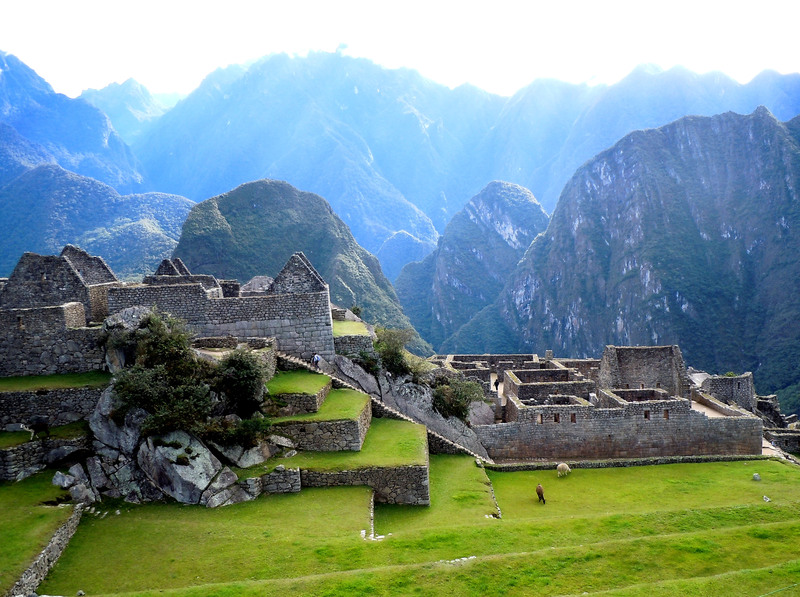 Fabulous shot Madhu – Machu Picchu is a place I’d dearly love to visit. Thank you Suzanne! It is on everyone’s list I am sure 🙂 I want to visit Vietnam badly and your photos pique my interest even more. Beautiful! This is high on my list of places I want to visit. Thank you Fergiemoto. It is an awesome experience. We couldn’t do the trail though, since R has issues with altitude sickness. Wow Madhu, thank you for the nomination!! I love your pictures, and the tales that you tell with such eloquence and enthusiasm. So far my blog has been focused on Spain but I wonder if I should go with Hong Kong, China, or even Laos. Thank you James! I love your stories too 🙂 I am sure you will do well by any of those destinations. Fantastic. Machu Picchu’s such an iconic place and that’s a great angle on it. This image more than any other I have seen makes me very much want to be standing where you were standing, makes me want to be there. Please continue to do that….music to my ears 🙂 I have a pretty good shot of the standard view that you see in postcards, but some how liked this angle much better. Glad you agree. Thank you for your generous comments! Yes, I’d better start soon. Thanks Madhu. Madhu its great to see a different view of Machu Picchu from the usual. Well done its fabulous and what an awesome trip it must have been, I envy you your travels! I wouldn’t be able to climb it either, I have asthma and wouldn’t be able to breath! Thanks Gilly. The climb inside the sanctuary isn;’t too bad if you don’t include the hikes upto the peak behind, or to the sun gate. It is the altitude that makes it seem difficult. Asthma could easily aggravate that. R has issues with altitude sickness and I was worried sick, but he was fine with only some minor headache and dizziness on our last day in Qusco. Amazing photo! This is giving me some serious wanderlust. Madhu, I could lose myself in these pictures! Just beautiful! And I have the strangest juxtaposition, on the other side of the world. Tintagel in Cornwall: not high like in Peru, but high for us hobbits 🙂 And very similar ruins. Ours are about 1000 years old, as I recall, or a little less, without those stunning mountains but with the Cornish coastline – it’s a tall island which juts out into the Atlantic. Strange they should look so similar. Doesn’t Tintagel have something to do with King Arthur? 1000 years makes it older than Machu Picchu! Do you have pictures of the island? Oh Wow, I am so jealous, I would love to see Machu Picchu, I have studied and read up on a lot of the ancient sights in South America, and it is definitely on my bucket list, just so fascinating the history of this wondrous place. Madhu, these are really striking photos. I like that you chose to shoot one of the less photographed views; you are right, the light and a new perspective add to the drama of the photo. How could they do that!!!! You should write to them pronto. That is so striking. And you are so eloquent describing it, something I lack. I love that tree covering the tree. I don’t know why. I just do. And I love there areeeeee nobody to find and populate that very striking sight. Thank you Rommel. If you check the larger image (you need to click on it) you will find a lone man wandering inside the walls and another black llama on the left! I hadn’t noticed till R pointed it out to me! Thank you Scott. It would be absolutely amazing! This is on my list!!!! As it should be 🙂 Thanks TBM. Stunning absolutely stunning..specially the last one Incan stonework ..looks straight out of some mythical era movie scene..the beauty around.. Thank you Soma 🙂 The setting is truly breathtaking. In all your travels you must have widdled in some amazing places, for a dog like me widdling is a sacred duty. I salute you for that although I am a little jealous. Oh, my OCD makes me prefer tinkling on porcelain! Can understand your need to mark your presence on those ancient stones though 🙂 Have no doubt you will get your turn. Funny…I’d never though to visit Peru before. But this picture has me thinking differently! So gorgeous. Oh, Peru has so much to offer Ameena. No big city thrills like Argentina or Chile, but oh so charming. You should go. You are most welcome 🙂 Glad you like it. Oh, you should go! We loved everything about Peru, Thanks for dropping by Ledrake. Machu Picchu – my dream place someday. The photograph hardly looks earthly. Such a wonderful perspective in the photo too. I always get the feeling that such places were dropped into the surrounding cliffs by a giant hand! Can you imagine building this place? The Incas were tiny people. Lovely carpeted terraces too. I neglect to visit you, but I always remember the post about your childhood home. That struck a chord with me, I guess. Yours is a wonderful place to visit, Madhu. Such overwhelming beauty. Your images are beautiful, as usual. Peru is very high on my list! Hope to get there soon. The decision finally made, Madhu. It’s a great one! Thanks Jo 🙂 I couldn’t possibly not choose Machu Picchu! And the picture is spectacular. Makes me remember Indiana Jones and his adventures. Exciting post. Thanks. Breathtaking, Madhu! Was the colour really like that with no camera tricks or adjustment? So beautiful!